Can a person who did not entrust to Amida Buddha during his life, change his mind and entrust while in the intermediate state between death and the next rebirth (bardo)? I do not recall any passage from Shinran, Rennyo, Honen or other Patriarch of our lineage in which liberation through faith while in bardo was specifically mentioned, but I personally think it is possible. In fact, Shinran too, said a few times in his writings that beings who are born in the Pure Land of Amida Buddha „are not solely from this world”, so I don’t see why a bardo being cannot go there if he comes in accord with Amida’s Primal Vow, that is, if he entrusts to Him, says His Name and wishes to go His Pure Land. The Primal Vow itself is all inclusive as Amida does not say there that only human beings can go to His Pure Land (- see my explanations of The meaning of "sentient beings of the ten quarters" from the Primal Vow). I explained the situation of bardo beings in the article, Contemplating the suffering of the intermediate state. There you can read that a bardo being can also hear, see and even understand the thoughts of others, so I cannot exclude the possibility that somebody can entrust to Amida even in bardo. Thus, if the intermediate being hears about Amida Buddha's salvation from a Dharma friend who stays near his dead body and encourages him to take refuge in Amida or if he remembers a teaching about Amida he received during his life and decides to entrust to Him, say His Name and wish to go to His Pure Land, then I am sure he can reach that land. However, I do not advise anybody to wait until bardo to entrust to Amida Buddha, when he can do it so easily here. One can never know what karma and ignorance can manifest during the intermediate state that may prevent a person without faith to remember or hear about Amida Buddha. So please, do not misunderstand my answer and try your best to solve your doubts while you are still alive so that you can automatically reach the Pure Land when you die. It is important to know that for a person who already entrusted to Amida Buddha there is NO bardo, as after death he goes directly to the Pure Land where he attains Buddhahood. However, because many people asked me for a way to help those who died and entered bardo state, I wrote the following words which can be read to any being who died recently, no matter he/she was a human or animal. So, from time to time, say these instructions in your mind or loudly to the conscience of the dead person (beings in bardo can understand your thoughts, but it may be easier for you to focus if you speak in a loud voice), and also repeat the Nembutsu as many times as you can. Try to do this for 49 days while the deceased may be in the intermediate state. Once a bardo being makes a sincere aspiration to be born in the Pure Land, entrusts to Amida and says His Name, he dies in the bardo state and is reborn in the Pure Land, as bardo is a state which can end anytime. 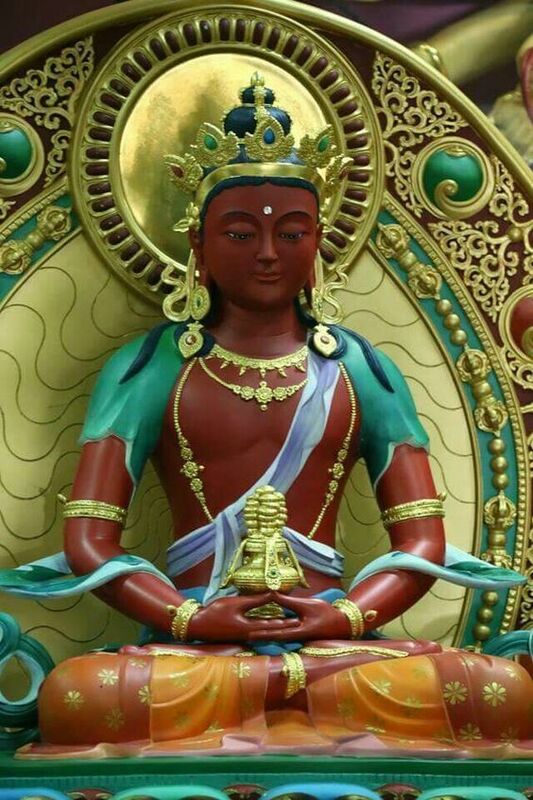 Amida Buddha is always at work, trying to save all beings from all states of existence, not only from our human realm, but if beings don’t accept Amida’s salvation then He cannot save them. The following instructions have exactly this goal in mind - to help a bardo being make the karmic connection with Amida Buddha and become open to Him. If he does so, then he receives faith, dies in the bardo state and goes to the Pure Land. However, you MUST be careful because to say the following words to a person who already has a strong non-Buddhist religious conviction, might enrage him and instead of making a connection with Amida Buddha, he can create the karma for the lower realms. Thus, I advise that these instructions for bardo beings should be said ONLY if you know that the person has a somewhat connection with or openness towards Amida Buddha or Buddhism in general, or he has no religious conviction but you know he might be open to the message you wish to transmit. If you suspect that a person who is now in bardo might generate (for any reason!) an adverse feeling towards your message or Amida Buddha you should better not say the following words, as you would not help him at all. Just as in daily life we do not convert people by force, beings in bardo should also not be forced into listening to our Dharma message even if it is the supreme Dharma message. "You died and you are now in the intermediary state between death and the next rebirth. When beings die, they go to this intermediary state and then they are reborn again in another form or body, depending on the actions they did in their previous lives. It is very important that you now do not be afraid of anything you see in the state you are in, and wish that you be reborn in the Pure Land of Amida Buddha. This Enlightened Person - Amida Buddha, is supreme in the universe, all-knowing and forever free from the repeated births and deaths, and any type of suffering. Having Great Love and Great Compassion, He made the Vow to bring to His Pure Land all beings who entrust to Him, say His Name (Namo Amida Bu) and wish to be born in His Pure Land after death. This is why I ask you to please, have faith in Amida Buddha, say His Name (Namo Amida Bu), and wish to be born in His Pure Land. Please do not pay attention to anything else you see here in our world or in the state you are now, but do only this - entrust yourself to Amida Buddha, say His Name (Namo Amida Bu), and wish to be born in His Pure Land. Namo Amida Bu means "I entrust to Amida Buddha/I take refuge in Amida Buddha/Homage to Amida Buddha". The Pure Land was created by Amida Buddha so that all beings, including you, be able to reach it easily after they die. There, in the Pure Land of Amida Buddha, you will be free from all suffering and you will never die again. So please, entrust yourself to Amida Buddha, say His Name (Namo Amida Bu), and wish to be born in His Pure Land. Namo Amida Bu, Namo Amida Bu, Namo Amida Bu......"
And are countless, innumerable, beyond calculation"
"If those suffering in the realms of hell, animals, hungry ghosts, or asuras see Amida’s light, there is none that does not gain respite and, though not delivered at once, attain liberation from sorrow and pain after death".